Zen P61 is a budget-friendly phone that features a 3.5 inches TFT display and a screen resolution of 320 pixels by 480 pixels. The phone runs on 1 GB RAM with an internal memory of 4 GB and can be expandable up to 16 GB via microSD card. On the camera front, the phone has a primary camera of 1.3 megapixels that promises to give decent photos with digital zoom features. The phone is backed up by 1000 mAh removable battery and claims to offer up to 5 hours of talk time. The phone works on core processor. 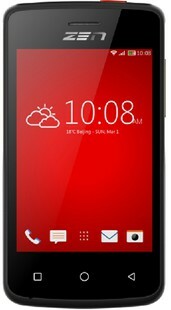 If you are looking for any mobile phone that fulfills your requirements, then you should go for this mobile. Zen P61 full specs and reviews as of Apr 2019. Buy it here!